Rockland County in New York State's Hudson Valley Region is only 25 minutes by car from midtown Manhattan and even closer from northern New Jersey. The county's towns range from urban to mixed sub-urban, many with a historic and quaint feel with American Revolutionary War sites in several. The county is perfect for biking, with easy roads laid out along the banks of the Hudson speckled with outcroppings of small towns and old buildings along the route. One major draw is the Palisades Mall in West Nyack known for its massive indoor stature, huge number of stores, many of them high-end, plus a regular theatre, an IMAX theatre, a Dave and Busters as well as several very good restaurants in addition the their food court which features an indoor roller coaster. 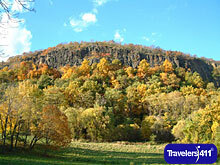 You will also find great golfing, hunting, fishing, hiking, biking, kayaking and dining options in Rockland County. Calherbe Monel, Director of Economic Development was on the July 27, 2014 "Travel with Stephanie Abrams!" Radio Show in hour 3. Join Calherbe Monel, Director of Economic Development for the Rockland County Office of Tourism and discover the magic of Rockland County in New York's Hudson Valley Region. Find quaint historic towns and sites, great shopping including the Palisades Mall in West Nyack, and great biking, camping, hunting, fishing, golf and dining.